Ruth’s Chris Steak House is well known for exceptional food and wine served in a fine dining atmosphere. With today’s secret recipe you can bring a taste of this fine dining experience into your own kitchen. They serve a delicious crab cake which is made with fresh lump crab meat, diced peppers and just the right amount of seasoning. These go great as an appetizer or a light meal. Pick through crab meat, removing any shells. Preheat oven to 400 degrees F. Place a heavy baking sheet with sides or a shallow ovenproof skillet in the oven to heat. When pan is hot, drizzle surface with olive oil. Using a 1/4 cup measure, scoop crab mixture onto hot pan and flatten slightly. Bake about 10 minutes, until golden brown and hot on the inside. Arrange 2 crab cakes on a serving plate; garnish with diced bell peppers. Serve immediately with your favorite sauce. NOTE: Baking (rather than the usual pan-frying) makes these soft-textured crab cakes easy to handle, but they are rather pale on top. 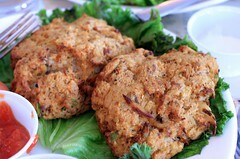 For a better appearance, bake on the uppermost oven rack, or bake 10 minutes, turn the crab cakes, then bake 2 minutes more. 2) Three Weird Belly-Flattening Secrets Revealed! Most brownies and desserts in general flat out make you fat. Today I have a delicious secret recipe for Ruth’s Chris’ barbecue shrimp that you can prepare easily at home. For over four decades Ruth’s Chris has been serving the best prime steaks and seafood in a fine dining atmosphere. These tasty shrimps are sauteed New Orleans style in a reduced white wine, butter and garlic sauce that has just the right amount of spice. Garlic mashed potatoes compliment this dish nicely. Wash shrimp under water and then peel the shells and discard. Devein the shrimp with a paring knife and then wash under water. Repeat until all shrimp are done, place on a sheet tray in the refrigerator. Place a large cast-iron skillet on a burner and heat over high heat. Add oil and cook shrimp until they are just done. Remove shrimp and set aside. Add green onions and cook for 1 minute. Add white wine and reduce the volume by half (any good dry white wine will work). When the wine is reduced by half, measure and add the chopped garlic, Worcestershire, Tabasco, cayenne pepper and paprika. Shake the pan well. Cook for 1 minute. Reduce the heat to low. Cut butter into small chunks with a knife and slowly add to pan, shaking fast to melt butter. Continue to add butter until it is all added and shake until butter is melted. Add shrimp back to pan and toss well to coat shrimp with butter and to heat through. 1) Save Up To $500 Or More On Your Next Flight. 2) Save 15% On Ink Cartridges & Photo Paper For Your Printer! Order your printers replacement ink cartridges at the lowest price available and have them shipped to your door. Ink Cartridges & Toner At Unbeatable Prices! At Ruth’s Chris Steak House they make a delicious bread pudding but after feasting on one of their mouth-watering steaks, I’m always way too stuffed (and feeling too guilty lol) to order it. I prefer to prepare this rich and decadent dessert at home since I can keep control of the portion size. This traditional Southern dessert is made with bourbon laced French bread and is topped with a whiskey cream sauce. This dish has been featured on the Ruth’s Chris menu for decades and once you taste it, you will understand why. Combine sugars and divide in half. Add cinnamon, eggs, vanilla, bourbon and salt to half of the sugar. In a saucepan, combine milk, half & half and butter with the other half of the sugar and bring to a boil. Whisk milk mixture into egg mixture, add raisins and apples. Add bread cubes and let stand until soaked through to center. Stir in a few raisins from the bottom and sprinkle a few on top. Pour into buttered baking dish (8 x 10 x 3 inches) and bake at 375° for 45 minutes. Serve warm with vanilla ice cream. Top with whiskey sauce. Place cream and 3/4 cup sugar in pot. Mix well and heat until it starts to boil. Place egg yolks, remaining sugar and vanilla in separate bowl. Mix until well blended. Whisk simmering cream into egg mixture and mix well. Transfer mixture into double boiler for 8-12 minutes, stirring constantly. Pass through strainer and cool. Measure out sweet cream and Jack Daniel’s and whip together well. Refrigerate. 1) Get Into Shape, Lose Weight, and Reduce Stress! 3) Attention All Chicken Dish Lovers!